Like some of the more unusual legal tender in other cultures of the world, the stone money from Yap is quite unique, and grand. This is not your typical gold coin or silver coin you could flip. You would need all your friends to help you flip it and I would not wait to catch it coming down. 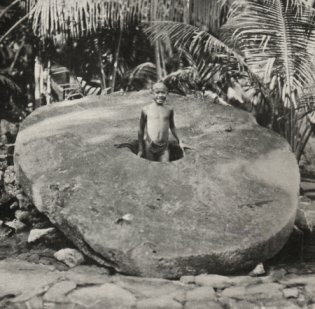 To continue from my post about the giant Easter Islands Monuments and this is my own theory; I’m speculating that the people who build the giant statues of the earlier post on this blog were part of the same (tribe of) people who manufactured the Rai or the giant stone coins of the Micronesian islands of Yap and Palau. My reason for thinking there may be a connection is because of what I have seen in Palau and Northern Marianas. There are giant statues all over the world and I am no archeologist. 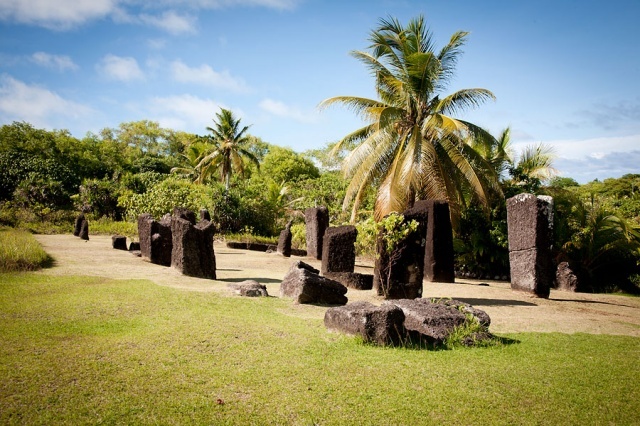 The Micronesians also have giant stone monoliths and statues. Yap became part of this ring of exchange and sharing giant objects when they brought the coins from Palau into Yap. Yap is one of four states of the Micronesia. The large coins pictured above and below were made from limestone disks and each represent wealth in a family group. There is a lot of reading in the history of all these large objects and studies are still being carried out on the mystery that surrounds the objects. Why did the Yapese take to this new kind of money? John Tharngan, historical preservation officer of Yap explained that the coins were invented during a period when the chiefs on Yap were struggling for power. “In those days all sorts of commodities were being used as valuables, including shells and turmeric and so the concept of bringing something in from outside, that didn’t exist on Yap, was very attractive. So when they brought this piece home and called it money, it encouraged other people to make the journey and bring stones back. So they went and brought more, this time in the shape of a full moon with a hole in the middle, for ease of transportation, like the ones you can see here on Yap”, Tharngan said. Jaime Hernandez – March 12, 2012 – Making the Rai. The value of the stone coins is determined by the number of lives lost during the process of transportation and the workmanship on each stone. They are used for buying land and bride price. I first saw the Rai at the National Museum of Palau in 2008. I asked many questions and got bemused looks from locals, to say that these coins were part of everyday trades, an undying culture passed through generations. I could not imagine a piece of coin carried by six adult male compared to a dollar you could pull out of your pocket and flick in the air, and in Papua New Guinea, we mostly used shells as our legal tender. Perhaps at one point, we also used stones. What a wonderful life blog picture. Yap is about 100 square kilometres and home to 12,000 people. 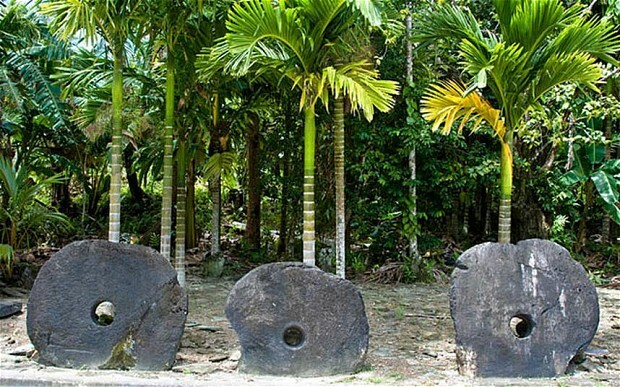 The island of Yap has no precious material like gold or silver instead, they use these giant disks of limestone called Rai as currency for large trades and still use them as small as seven to eight centimetres in diameter to trade with. The larger ones stand as high as 3.65metres (12 feet tall) and weigh five tonne. Many of the Yapese coins were carved in Palau and shipped 400 metres to Yap. There was a story that once a large Rai was transported across the water between the Yapese and it tipped the canoe and sank. This coin was always remembered and its value (for the family that owned that coin) was continued to be used in the trades. Read more on the Yap’s coins on the links below. Most unusual money in the world – what a wonderful life blog also has an article about money from other cultures. Thank you Patrick! Lovely to see you. Now that’s heavy money…;) Very interesting post Joycelin. Thank you very much Norma. Thank you very much for sharing Jack and you’re very welcome – any time. I know – it is a pretty wild guess…have to investigate more. Thank you Jack.